Hands up who has managed to migrate an Exchange 2003 without getting an error of some resource (mailbox, public folder, oab generator ) still present on the legacy server being uninstalled. Indeed, as usual, the error can be misleading because you can do all the controls that you want and you will not find any mailbox still residing on the old server (vabeh se siete sicuri di averle migrate tutte ovviamente 🙂 ); I will tell you more…. you can also delete the database from the Exchange 2003 but the error will appear again during uninstallation. Okay….. how the hell is it possible that there is still a mailbox on the old server if there is not even the database!?!?!? Obviously in this case the message is misleading, I will never be tire of thanking exchange developers for the lost hours to find a sense in their errors. What really happens is that some users has some exchange attributes set without actually having any mailbox. May be due to the fact that a mailbox was disconnected from a user, often happens that the attributes of exchange remain in any case configured but in fact the user has no mailbox connected. Yes, but what user??? 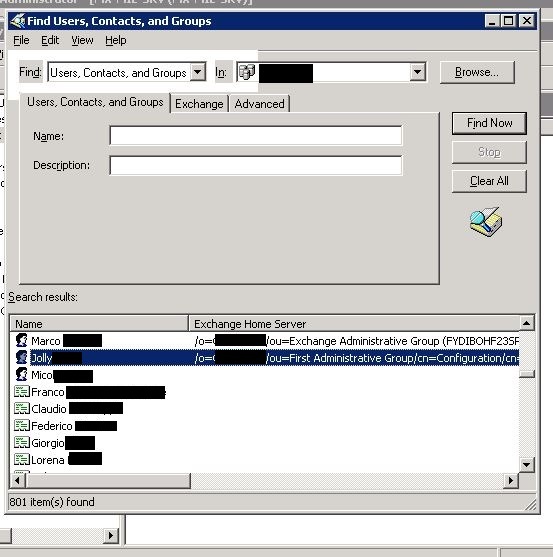 To find the user or users that have this “issue” the simplest thing is to use active directory user and computer console on the exchange server. You have to do a search for all users in the domain and add to the displayed columns the one that displays “Exchange home server”, perfect after having put in order for this column the users who still have some attribute to the legacy servers will come evident.